Things to Love About Rural Living, After living for a long time in urban and suburban environments, I am now living a rural lifestyle. But I sure do enjoy rural living 52 weeks a year in a place where I used to vacation for 2 weeks a year. Apart from a few years that I spent as an urban dweller many years ago, I have lived most of my life in the country. For me, it is the only real choice. If you’re like me, then you know what I’m talking about. City living doesn’t have a lot to recommend it. The noise, the stink, the pollution and the excessive number of people, all of these things are enough to drive me crazy. My life in the country is different in virtually every way. Surrounded by the soft sounds of nature, I have plenty of opportunities to contemplate my thoughts or carry on a conversation. The air is crisp and clear. When the sun goes down, I feel like I have a front seat in the audience for viewing the entire Milky Way. I sometimes go for days without seeing another person except those who live with me, yet I’m never lonely. There’s just so much to see and do. My garden always needs tending, and I have animals that make for incredibly good company. Of course, one of the best things about country living is being able to be so close to nature. During my years in the city, I felt nearly cut off from nature. All of my walks involved asphalt and concrete. Seeing some grass, let alone walking on it, was rare. The trees I saw tended to be less than impressive, and flowers were nearly unheard of. For miles around, I can explore pastures, meadows and forests. The gently rolling landscape is just perfect for enjoying a healthy walk, and you can bet that I’m out there pretty nearly 365 days a year. I will admit that as I have gotten older, the terrain has become a little more difficult to handle. It’s only natural that after many years of activity I would experience some joint stiffness and other mild complaints. Plus, sometimes I feel like I’m just not as surefooted as I used to be. Now, I have never been accused of being a quitter, and I don’t intend for that kind of mindset to take over at this point. I started looking around for a solution. A friend that I regularly run into at a store in town suggested that I look into getting a walking cane, so I started doing some searching on the Internet. That’s how I discovered the Brazos Walking Sticks Company. It’s a US company that’s located in Texas, so I feel like they really understand my fiercely independent lifestyle. The fact that each of their walking sticks is fashioned by hand, one at a time, was also incredibly appealing. I mean, who’s heard of that kind of craftsmanship in this day and age? Most products are turned out by the dozen on mechanized assembly lines located in some other country that isn’t the US. However, I feel like this is one company that’s really doing it right. They genuinely care about their products and what people think of them. I spent quite a bit of time on their website before ultimately deciding on the Twisted Sassafras Turned Knob Walking Cane. Its appearance is really eye catching. The shaft is made from sassafras with some of the bark left on for added appeal. In fact, the bark forms the “twist” around the shaft, and it looks amazing. As good as the pictures online are, seeing my own walking cane from Brazos Walking Sticks Company was something entirely different. The piece has a really beautiful sheen, and the orange and red colors are gorgeous. I’m impressed by how lightweight this stick is, yet it appears to be amazingly durable. No matter the terrain or the weather, I know that my Twisted Sassafras Turned Knob Walking Cane is up to the task. The wood that is used to create this stick is incredibly well polished. It feels so smooth and comfortable in my hand. Available in two lengths, I was able to get the size that is perfect for my height. Additionally, it’s possible to add all sorts of personalization and accessories to these walking sticks. I added my monogram and the combi-spike tip so that my cane would be a true go-anywhere accessory. If you like, you also can add a cane strap or other embellishments like an American flag medallion or a pewter star. Brazos even offers a thermometer, so if you’re concerned about the temperature, that might be a sensible addition for you. One of the things that I find so appealing about this cane is that it has so much personality. I’ve seen plenty of people walking around with a plain, impersonal cane made from metal or another less-imaginative material, but it’s rare to see someone with such an outstanding and unique accessory in their hand. I guess what I’m saying is that I appreciate that this cane was made from a material that once was a part of a living tree. In some ways, I feel like it’s an extension of nature, and that fits in well with my lifestyle. Plus, anyone can see how sturdy and dependable this cane is in addition to being well made. This is probably going to end up a family heirloom for my country-loving relatives. Initially, I had planned to only use my walking cane while going on my long rambles through the countryside. Now I take it pretty much everywhere I go. When I bring it into town, people are always impressed with it, and I can’t stop myself from telling the story. I also tell them, only if I’m asked, how much I paid for my stick. It never fails to astound people that this impressive and functional piece of art costs so little. I think it just might be the smartest purchase I’ve ever made. I have no intention of ever giving up my independent country lifestyle. My walking stick is one more tool that makes that possible. I don’t have to spend 10% of each day commuting. For years I did it in the morning, and then I did it at night, and I repeated the cycle five days a week. What a waste of time, energy, and emotional well-being. 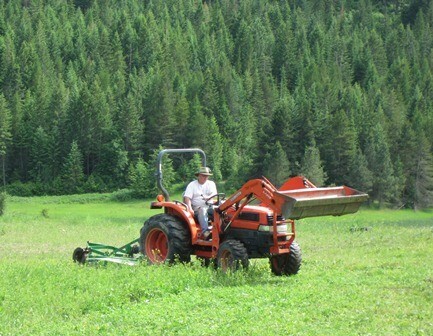 Nowadays, my vehicle of choice is a tractor and there’s hardly any traffic! I am happy when I wake up. I don’t dread a new day. Each day is a new one full of adventure, projects and challenges. The old routine called the “daily grind” is history. I live in a safe environment. I leave my keys in my truck. My dogs are the best doorbell I’ve ever had! I know the history of much of my food nowadays. No more worry about food scares and where my food is coming from. My food doesn’t have unknown additives, hormones, enhancers, and other stuff that just isn’t good for you. I will live a longer life than if I had stayed in the city. My food has flavor, too. Just try one of my tomatoes and compare it to one from a supermarket. Things are growing all around me. I am surrounded by real life—living things. I can look at my garden and watch my own livestock from my kitchen window. On my way into town one day, I saw literally hundreds of deer and wild turkeys. I really enjoy watching the eagles soaring above me as I work on my property. My kids are learning about life. They know where their food is coming from, and they are responsible for some of that. They are able to follow their desires and passions, whether it is growing food, flowers, or animals. They run around and play and I don’t have to worry. They have become much more self-sufficient and confident. They are no longer addicted to the Social Media, text messaging, or video games. My family is somewhat protected from potential issues in the future. All is not well in the economic, political and global environments. Unemployment, home foreclosures, civil unrest… are things really getting better? The civil consequences of all of this will be hitting the urban areas much more than the rural areas. I can be out hunting in five minutes. I can be catching a fish in thirty minutes. Couldn’t do that in my suburban neighborhood. They are ready to help me with a phone call and when we pass on the road, they always make time to stop and say hello. In my last neighborhood, I barely knew or even saw my neighbors. My family lives here too! Long, long ago, December 25 was designated as a day to celebrate the birth of our Lord Jesus. Over the years, other cultural and personal traditions became a part of Christmas celebrations. Our family embraces both the sincere appreciation of Jesus in our lives and the joy of participating in many fun and meaningful aspects of the season. We stretch our celebration into about six weeks, from the day after American Thanksgiving in late November into the first week of January. Each year we attend some new events, try some new recipes, and make some new decorations. But the basis of our celebration of the season is a cornerstone of family traditions. Family traditions give a family a sense of belonging, routine, and anticipation. They provide a cohesiveness that can bring everyone together no matter what the circumstances. If a teenager is feeling like an outsider or wondering which planet his parents came from, family traditions can bind everyone together in shared history and memories. Someone going through a tough time can relax and be reminded that he or she is not alone. Newcomers to the family can be invited to introduce some of their own traditions as the family melds together. A new family being formed by remarriage can encourage the family blending by incorporating traditions from each merging family and then creating new traditions together. With turmoil all around us in the world and even in our communities, there’s something dependable and faithful and even comforting about participating in a family tradition. Traditions also promote expectations, which can be good or bad. In our family we try to focus on the positive ones and eliminate or adapt those with heavy strings attached. We’ve also kept an eye on interests and abilities as years go by and people change. Some traditions just die of old age or are replaced by more appropriate or comfortable activities. In the past decades, as we shaped our own family’s winter holiday traditions, we carried over a few from our own childhoods. Each of us had always gotten a tangerine at the bottom of our Christmas stockings. We both had fun memories of annual visits from “Santa” as part of Christmas Eve preparations and Christmas morning surprises. Holiday music was played in both of our childhood homes; local concerts and Christmas Eve candlelight services were special events. On the other hand, we dropped with a thud the traditional fruitcakes of our childhood. We tweaked the typical Christmas Eve and Christmas Day menus of our parents and grandparents. We added activities like our annual trip to a rural tree farm to select and cut down the “perfect” tree. We made our own set of traditions and our own memories as we raised our children. Today they do the same in their homes, keeping some of our traditions alive and adding others that fit their families. The four younger families in our nuclear family have developed their own traditions. Each family has maintained some of the parents’ childhood traditions and initiated new ones tailored for the family members and the changing times. And even those traditions are fine-tuned as the children–our grandchildren–grow older, bringing home their own ideas and indicating their favorite traditions and the ones they could do without. Nowadays, three generations of our family celebrate the season together. First a flurry of family emails goes around with discussions of when and where to gather together, what food to share, what type of gift exchange to have. We bake cookies and share special holiday food–both old favorites and new recipes. Some of us even watch sappy holiday movies; Jim and Marie’s annual favorites include It’s a Wonderful Life, The Christmas Story, Christmas with the Kranks, The Santa Clause series, and our most recent additions, Mrs. Miracle and Call Me Mrs. Miracle. It’s never too late to start initiating family traditions. 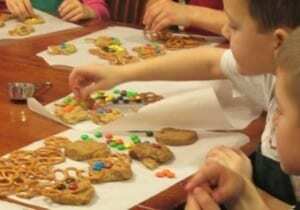 Any favorite activity, project, or food your family enjoys is a candidate for a tradition. If you’re short on ideas, ask friends about their traditions or search blogs, magazines, and books for others. Here are a few of our own special customs. We gave each of our children a tree ornament every year so that when they left home as adults they had their own sets of decorations to start with. We still give each family an ornament most years and give each grandchild one as well. Some of the ornaments have been purchased, but most were handmade. Usually the ornament has some significance either for the individual child or for the family. Our kids’ collections have included their favorite animals or pets, college logo ornaments, symbols of that year’s family vacation, and a shiny key to signify the first driver’s license. Last year Marie made felt hens for the grandkids, using the color of each child’s favorite chicken in our flock. This year our farm kids will have little piggy ornaments to signify the new farm project of the year. Over the years we have brought home small tokens from vacation spots for our own ornament collection. If they weren’t already tree decorations, a bit of ribbon or other adornment was added to what was originally a fridge magnet or key ring. 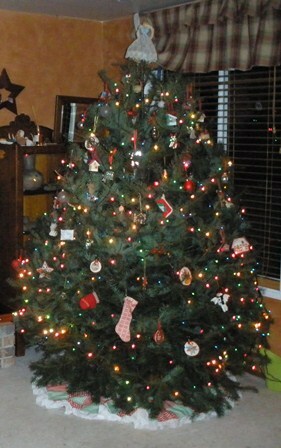 Nowadays our tree is like a walk down memory lane that evokes wonderful memories from years gone by. We encourage each of our four young families to spend a leisurely Christmas morning at home, so our extended family gathering is usually on a weekend in December or even early January. It’s not unusual for some families to stay overnight, and we may even have a “Christmas Eve” and a “Christmas Day” over two days so we can fit in all three of our favorite holiday meals. As the family grows, the gift-giving changes. Some years the adult kids draw names among themselves. We usually have some kind of silly or serious gift bag exchange so Marie can direct whatever new pass-and-steal game she’s discovered for that year. And there is one gift that keeps on giving–we never know from one year to the next which of the women is going to receive the 80s style hot pink shoes! Though we have a sit-down dinner on Christmas Day, we like to keep things simple on Christmas Eve. We can graze and eat when we’re hungry, there’s always plenty for friends who stop by, and best of all–preparation and cleanup are fairly simple. Everyone brings some type of appetizer to contribute. Nowadays we enjoy this buffet as the main meal of our family gathering. Our favorite must-haves include slow cooker sweet and sour meatballs; veggie trays with pickles and–of course–olives for fingers; pigs in blankets made with refrigerated tubes of croissant dough and cocktail wieners; and other specialties introduced over the years. Our kids who married into the family have added their favorites from their own family gatherings. And oh will there be Christmas cookies, including old traditions like spritz, Jan Hagel, and frosted sugar cookies; more recently acquired favorites; and some nostalgic holiday treats we adopted during the years we lived in Germany. As our children developed their own styles in the kitchen, we discovered who had a flair for this or that. 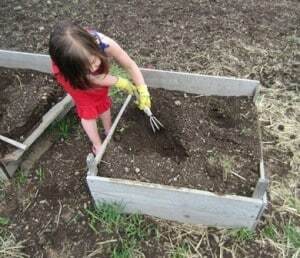 Now the oldest grandchildren are beginning to contribute their specialties. Let’s just say there’s never a shortage of delicious and appetizing food at our gatherings. We start our Christmas morning breakfast with some kind of a cake, with candles and all. Over the years we had coffee cake and yeast rolls. We finally settled on our now-traditional “cake” of homemade cinnamon rolls in a large pan. We sing “Happy Birthday” to Jesus and blow out the candles for him. Days before Christmas, Marie shapes the cinnamon rolls and freezes them unbaked. On Christmas Eve, she sets the frozen rolls out to thaw overnight. In the morning she pops them in the oven and they’re fresh and hot for breakfast. When the kids were young we also had neighborhood birthday parties for Jesus. Each guest brought a toy for the town’s giving tree or groceries for the local food bank. This gave the children a sense of reaching out to others as well as a reminder of the focus of the season. Other ways of giving to the community include taking children’s names from a “giving tree” and selecting gifts. Sharing groceries or prepared food with a local family; and caroling in the neighborhood or at a special care facility. One of our traditions is just several years old. It involves Grammy and all the grandkids, though Papa and parents are allowed to watch and help little ones. Grammy saw a fun cookie in a magazine before she became a grandma and filed the idea away for later. Now the grandkids from toddlers to teens look forward to baking day. We try to get as many of the grandkids together at one time; this year we made the cookies on Thanksgiving after dinner dishes had been cleared away. You may have seen reindeer cookies in various colors and forms. Special apron for each child; AbbyKate Designs will embroider names on cotton aprons. Don’t forget one for Mom or Grandma! 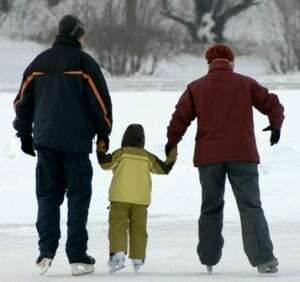 Family traditions may be deliberately developed or spontaneously adopted. They may be serious or funny, simple or complicated, old-fashioned or modern and trendy. The important thing is that they are valuable to your family in some way and they evoke warm memories as years go by. And by the way, family traditions are not just for Christmas! Maybe you serve green pancakes for St. Pat’s, or hunt for pumpkins in October. Do you have a special end-of-school year party? Snow pudding with the first good snowfall? This December many families all over the world are grieving after tragic losses. Others are struggling to make ends meet and navigate an ever-changing economical climate. 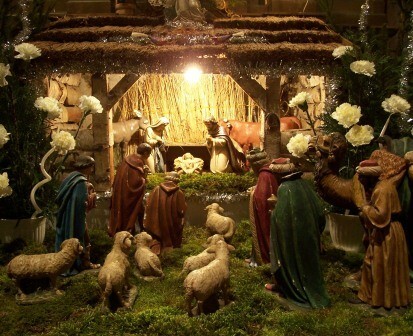 In the midst of it all, we are ever mindful of the true reason we celebrate Christmas. Jesus is the reason for the season, and our hope for navigating the future is in him. We all wish you a warm and fulfilling holiday season. Our blog may be quieter than usual while we spend time with family and friends, but we have more helpful posts and something new planned. For me, it is being humbled daily by the glory of nature and the landscape which surrounds me. To watch the weather change, minute by minute, the closeness to the nature which chooses to visit us and share our lives, and the lack of traffic, sirens, and clatter of urban living. I have an art gallery in Snowdonia, Wales, with 210 degree mountain views, and every second is one of sheer joy when I’m out amongst it taking photos or working with those around me. Graeme, you must be surrounded by inspiration in every view from your gallery! Your photos are beautiful–I’ll have to go back to your website and spend some time looking through the galleries. Thanks for joining us! As a native of Chicago who never thought about leaving the big city, I am happy the Lord led me away. I left big city living in 2005, and not looking back. I spent 5 yrs in W. TN where we had 15 1/2 acres and could not see a house from our porch. In 2010 we moved to Louisiana and have an acre, I can see the neighbors, and they can see me too close. While everyone gets along I prefer more space, love country living. The biggest thing I love is not having to deal with neighbors attitudes. Joyce, thanks for stopping by! We moved here from a home where we could talk to our neighbors from our respective back decks without shouting. Now we can’t see another house from our porches. Quite a difference! I like the quiet. And I like that people you don’t even know will wave as you go by. Ditto to both the quiet and the friendly people, Linda. You have a lovely weekend too! I have recently realized that I had gotten ‘use’ to my rural surroundings. After visiting family in a large town, I could not wait until I got home. Even became ‘closed in on’ in town. I have been very fortunate to live very rural for 25 years. I couldn’t go back..thanks for a great post. Nice to see you, Nancy! There sure is lots to love about country life. Your photos for example! Buttons, it is really interesting how family-like a rural neighborhood can be even with only a few houses on a mile-long road. People offer help and experienced advice, and ask for help when they need it. We know the feeling, Jonni…we dread driving in heavy traffic anymore! And that used to be part of our daily grind. Now our daily grind is the coffee we have in the morning while enjoying the sights and sounds of nature all around us.